Sessions are $25 and are 15 minutes long. For walk-ins we accept cash or venmo only. WE HAVE A 24-HOUR REFUND POLICY FOR CANCELLATIONS. By appointment @ 421 Graham Ave. I met Houiea after a friend recommended his beautiful succinct Akashic readings to me. Houiea is a Bronx-based healing artist who works with his own amalgam of healing modalities, most notably (but not at all limited to) his Akashic readings and trainings. I wanted to offer his services to all of you because he has a true psychic gift, and his offerings are of a high integrity and his entire practice is centered around being the purest manifestation of LOVE in this lifetime. You can explore more about him here. This offering is a psychic reading via oracle and tarot cards specifically geared towards preparing for the upcoming Mercury Retrogrades. OR the option of an Akashic Records reading. The Akashic records are a sacred cosmic text that contain the information of your soul’s journey. Accessing them gives us clues to our heart’s true desire and patterns and how to see them with love and compassion. Retrogrades are not time to push, but with so much social conditioning around constant action and “growth” we often need a little compassion and guidance during these times about what is meant to be worked out and worked through. Spots are limited at these introductory prices and we are really excited to host Houiea here at the shop for the very fist time. I have been called to share my process to use writing as a tool for healing - for myself and with my community. Join me Friday 3/15 7:30-9:30 PM to make space for your emotional and mental processing to unfold with the support of myself and the group. We will work through guided meditation, writing exercises and channeled messages. This class will be focused on how to identify your frustrations and discover the threads that energetically tie together in order to articulate the lesson you have been called to learn from this, and to receive support in how to change these patterns. This offering is a psychic reading via oracle and tarot cards specifically geared towards preparing for the upcoming Mercury Retrogrades. Myths of Creation & Dusty Rose Vintage invite you to a collective gathering of creative business owners to support one another and prioritize themselves, their goals, visions and strategies. Business ownership can be lonely. Often we get lost in the day-to-day and forget to make space for ourselves to receive support, hear others' experiences, share our resources and check in with ourselves. Our intention is to make a private and strictly-enforced safe space, so any sharing about our sensitive business experiences will not be tolerated. At this gathering we will begin with a centering exercise, introduce our businesses, identify one problem we need help with and one resource we have to offer, and compete writing exercises to get clearer on our goals and strategies. We ask a donation of $10-15 for this accessible peer-coaching-meets-therapy space we will share together. All levels of business ownership are welcome. Feel free to forward to your friends. To guarantee your spot RSVP here: and feel free to forward to anyone who would feel served by this offering. This event is BYO snacks/beverages. SHAME is one of the most charged words and emotions that I have encountered in my own healing as well as in the work I do with others. Join Xenia in a ritual in which we shine a light on the origins of shame, creatively guided through meditation and a series of writing exercises in order to pin point narratives we carry in our subconsciouses to deepen our understanding of how these narratives affect our identity and self worth. By creating a safe and sacred container to delve deeply into our understanding of this mysterious and often difficult emotion, we will transform this powerful emotional energy into compassion, creation and healing. I have long been interested in the intersection of technology and spirituality. For thousands of years ancient wisdom traditions from all over the world have created systems of energetic centers or chakras, that show another dimension of how matter organizes itself. I am so pleased to announce we will be hosting Sixth Sense Energy Imaging. Sixth Sense is a divinely-guided aura photographer, created by Victoria Tiley and Chris Carlone and designed to provide you with the energetic tools to improve your life. Each session will be 15 minutes and includes a professional aura photo as well as a 23-page aura, chakra and personality report and a consultation with an intuitive energy worker. Victoria Tiley is a Shamanic Reiki Master and Past Life Regression Hypnotherapist. For more about Victoria’s work visit Awen Spirit Healing. Chris Carlone is a Professional Photographer and Artist, a skilled Reiki Practitioner and an End of Life Doula. Join us for the inaugural hosting of Aura Wear for mini reading sessions. Susanna comes from a line of intuitive aura seers. Her work combines her love of design, styling and fashion with her deep understanding of color and how its frequency affects our vibrations. **Readings are $25 for 15 minutes. In this time you will receive your main aura colors, suggestions on colors that complement and support your energy as well as other insights specific to you. Her other obsession is acting, and at 18, Susanna moved from small town Missouri to New York to devote her life to the stage. She performed in national and international shows as well as on Broadway before once again following the lure of colors. Soon she was working under a Brookyln jewelry designer, where she honed her skills and got her first taste of the fashion industry. As her studies deepened, Susanna began seeing auras vividly around her in a way that seemed to expose people’s thoughts and emotions. The colors began to make sense to her and the connections became easy to follow. Now Susanna uses this gift to help clients connect with their auras, understand the power of colors and make life-changing adjustments to their life via their wardrobe. She conducts everything from full makeovers and closet overhauls to photoshoot and branding consults. Aura Wear is here to make you feel balanced, radiant and in touch with who you intrinsically are. She believes that just as you need a health coach or massage therapist you need an aura consultant to make you feel truly balanced and in touch with who your own energy. Learn more about Susanna's full services here. Join us for a celebration of the Divine Feminine and the magical medicine of Wadulisi Woman. This December pop up will be a day of holding space for one another during Ashley’s New York residency. Featuring her small batch garden-crafted flower essences and limited edition channeled watercolor prints, this pop up is a beautiful place to celebrate her work, and to get a touch and feel for her powerful yet gentle amalgam of creativity and healing gifts. Ashley is known for her Soul Tattoos. Soul Tattoo™ sessions are one-of-a-kind hand poked ceremonial, healing, conscious tattoo experiences with each design and it's medicine being divinely channeled as a mirror of deep reflection and activation for each client. ALL FLASH SPOTS are being booked through the Wadulisi Woman Newsletter and Website. Please RSVP below if you would like to hold space for magic with us, enjoy floral teas and gentle flower-centric cocktails. Soul Tattoo™ sessions are one-of-a-kind hand poked ceremonial, healing, conscious tattoo experiences with each design and it's medicine being divinely channeled as a mirror of deep reflection and activation for each client. Each session varies from client to client, as no person is the same and no Soul Tattoo is the same! In these sessions we begin with a tea and some intention setting, to connect more deeply to the process and medicine that wishes to come through for each individuals highest good. During the session Ash scans the aura and energy body to gather medicine and messages from the client's highest self, energy body, and guides. The Soul Tattoo design is channeled in and can include plant medicine, sacred symbolism, animal totems, numerology, astrology, or whatever symbolic medicine needs to come through for the client. Once the design is set, we will further discuss the chakras, the body, and energy meridians to align the design on to the place on the body that is most aligned for the client's personal healing. Healing energy work is done before and during the tattooing to deeply relax and open, while also activating energetic shifts, releases, creating space within for the activation of the medicine of your Soul Tattoo, and for deeper alignment on one's sacred path. This work is taking tattooing back to it's magical origins—centuries and lightyears before the tattoo machine—when tattoos were light activations, spells, protection, feminine temple rituals, and stories of the soul. These delicate tattoos act as portals of activation, symbols of empowerment, and medicine that goes much deeper than the art you see on the surface. If you are like me, and are more of an "Advanced Beginner" you can ask Courtney questions about 2019 and the year ahead for your career, your love life, your creativity… anything at all! Sasha Formoso speaks the language of astrology and fashion. She uses her technical and intuitive understanding of the Cosmic birth chart in order to create parameters for you to embrace your soul’s true nature and to express that beauty through how you dress. Combining the empowering notions and self-study of astrology with the individuating process of defining one’s own “personal style” Sasha is able to show you all the dimensions of who you truly are and shape those concepts into something you can see, touch and feel everyday. Get ready to radiate your magnetism and signal to the world your beautiful unique energy. Readings are 25 minutes and include a look at your birth chart, as well as styling suggestions, and in-shop recommendations. These readings use the energetic vibration of color to reflect what we are going through on your present journey, offering guidance in a non-judgemental and honest light. Readings are $30 for 20 minutes. 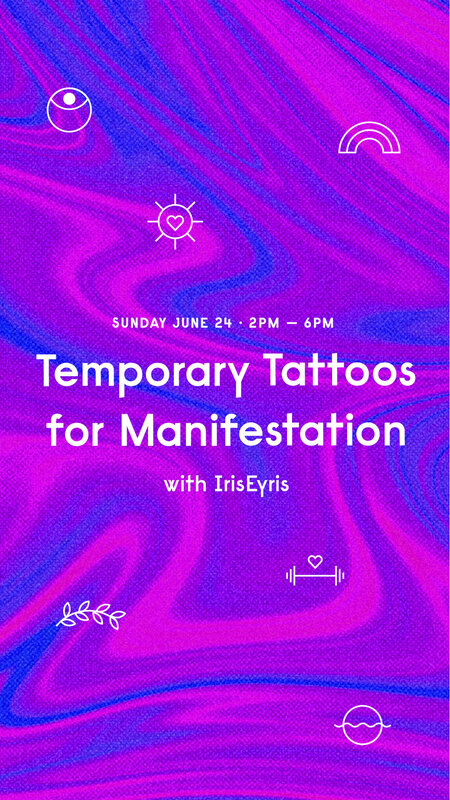 We’ll be offering a 20% discount off all IrisEyris products to those who book readings, including the Chroma Calendar, Color, Form & Magic, Spell Tats & the IrisEyris Prism Oracle Full Spectrum Edition. IrisEyris was founded by Nicole Pivirotto in order to merge design & healing into a unified practice. Equally inspired by contemporary design, and ancient mysticism she creates artwork and accessories for the modern world. Nicole is an Art Director, Designer, and born intuitive. She has her MFA in Design from The School of Visual Arts, and has been a practicing designer for over 10 years. In addition she is a Reiki Master, a certified Akashic Records Practitioner, has completed HT-01 Breathwork training, and has deeply studied the Tarot for several years. By combining the healing properties of plants with the power of intention, each garment we create has an energy and beauty you can feel throughout your day. Because it’s our belief that clothing made and worn with intention has the power to transform. Join Barrie Cohen as she launches her new venture Anthemia at Myths of Creation for an opening reception on Saturday 10/26 + an all day pop up on 10/27. Anthemia is created by farmer, herbalist, and artist Barrie Cohen. Barrie grew up in New York City but always felt a deep connection to nature. In her early twenties, she began working on organic vegetable farms, first in New Zealand and then across the U.S., from California to New York. Through years of farming and study, Barrie became increasingly well-versed in plants and their medicinal properties, eventually falling in love with the traditional practice of plant dyeing. Today, Barrie works out of her studio in Brooklyn but still frequents local farms where she collects flowers and dye plants. 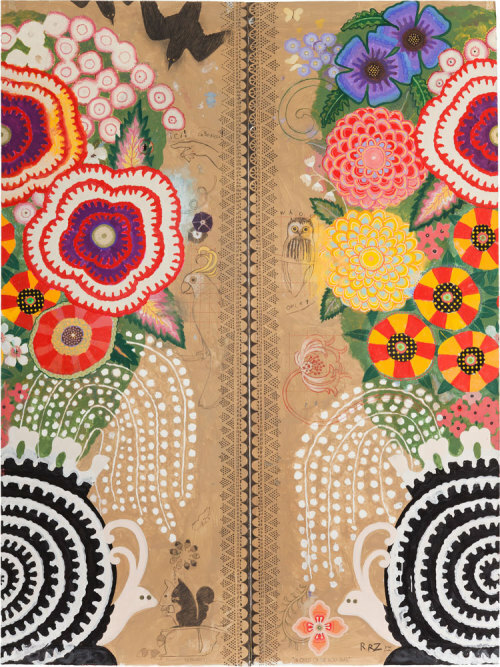 Through Anthemia—which means “cluster of flowers” in Greek—Barrie combines her artistry in dyeing with her training in tarot. The result is one-of-a-kind garments that reflect the magic possibilities of dressing with intention. Join us as we host our very own Mythsfit Brenda Azu for a day of magical offerings and one-of-a-kind ritual tools. Brenda Azu is a latino artist, photographer, computer nerd, smudge stick creator, crystal bruja, reiki practitioner and plant mom. From a very early age Brenda showed signs of creativity in various fields, at the age of 14 Brenda decided she wanted to be a photographer and attended her top school (Fashion Institute of Technology) and has a degree in photography and science. Brenda while being involved in the arts, she curated an all female gallery show called “Fairy Paradise” in January 2017 showcasing 10+ young artist in various mediums. Like many young professionals Brenda has expanded her wings to other fields and dimensions and has found a calling in the healing arts. Brenda creates custom smudge sticks based on individual needs as well as custom crystal jewelry. As of February 2018 Brenda has created a female empowerment group called Warrior Goddess Training based on the book/teachings of HeatherAsh Amara. In this month long weekly meetings young women gather and in a safe environment are able to ask questions and get different perspectives from one another. Brenda is a Capricorn sun, Aries moon and Aries Rising. Join us in an evening of heart opening with Florencia Fridman, half of Cacao Laboratory, a company that brings ceremonial grade cacao to New York through direct relationships with farmers in Central and South America. Caco laboratory carefully selects ancient strains of cacao and blends them with different plant medicines to help you gain a deeper sense of connection to the world around you. Learn more about Cacao Laboratory here. I met Reverend Cathy Towle through a Reiki sister of mine. I was interested in getting my second Reiki attunement (a healing technique of Japanese origin) when I learned of Cathy's practice that combined reiki, shamanic healing techniques, mediumship, and her ability to act as a mediator between her client's guides and her own to facilitate soul retrieval, healing, and ancestral connection. Experience the magic of energetic transformation with Reiki and Sound practitioner and creator of Spirit Work, Kristen Sonntag. Spirit Work Sessions combine the energies of healing crystals, aromatherapy, sound vibrations, and Reiki, to promote emotional balance and wellbeing. The portal of the Autumn Equinox offers a beautiful opportunity to nurture our intuition and become centered within as we transition into the new season. In these sessions you will receive a Reiki treatment featuring aromatherapy and sound, an intuitively selected crystal to keep, as well as individualized suggestions to evolve with the energies of the season. We are all born with powerful gifts - intuition, sensitivity, and empathy. As we age, we unconsciously learn to cut ourselves off from these abilities in order to survive in a fast-paced, masculine, over-stimulating world. And yet, we can't ever truly deny them! It may be hard to believe that your empathic sensibilities are gifts, especially when they can feel overwhelming and uncontrollable. But these abilities are here to serve you, and there are many ways to master them and make them work for you. During this interactive workshop, Jordan will teach you how to understand your own energy better, and how to create healthy and clear boundaries with others. You will learn several energy-clearing and energetic protection techniques, how to create your own spiritual hygiene practices, and learn several practical tools for everyday life. Whether you were in the previous workshops or not, you will gain valuable knowledge for thriving in this world as an empowered empath. And, we will be creating special, customized energy-clearing mists in class! You will leave feeling empowered, clear, and grounded. If you are not in the city, join us via the magic of the internet - there is a livesteam option so everyone can join us! Jordan is a medicine-maker and healer who practices Reiki, 13th Octave LaHoChi, Pranayama Breathwork, Tarot, and create Plant & Vibrational Medicines. She has studied with renowned healers such as Ari Roberts, Pamela Miles, Padma Gonzalez, and David Elliot. 1. Pick a temp tat that is in alignment with what you're looking to manifest. 2. 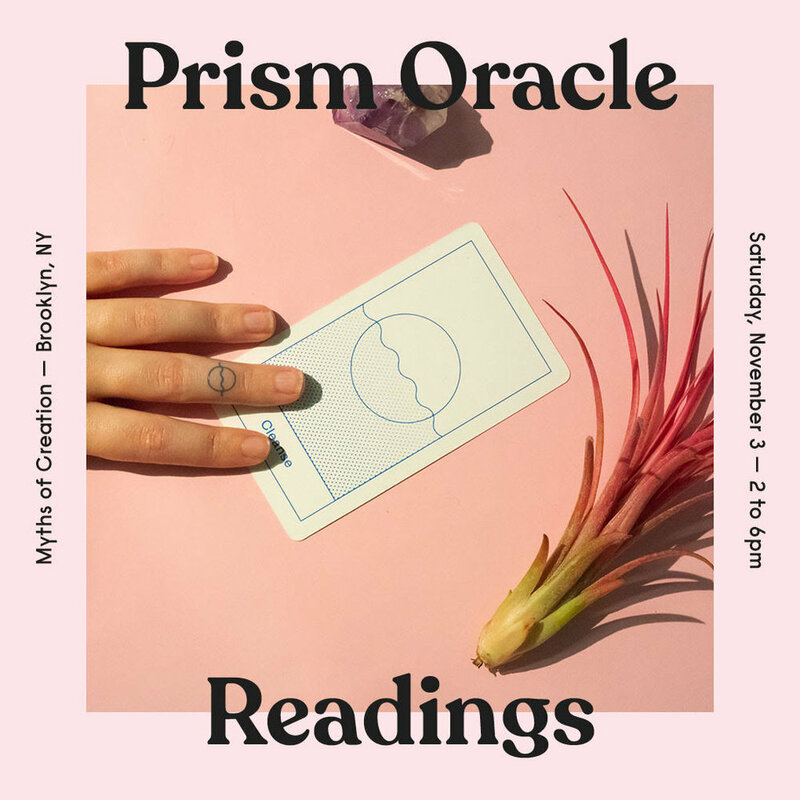 Get a mini reading using The Prism Oracle to give you some more insight surrounding your goal. 3. Your tat is applied using rosewater and a pinch of Reiki. 4. When your tat washes off, your spell has been cast! Each session is 20 min, and a sliding scale of $25 – $40. Each additional tat is $5. DM or email @shopmyths to book your spot in advance. See you there 🙂! A beautiful pop up between friends BRENDA AZU and LUNA STONES features astrological smudges, energetically-lifting jewelry and apothecary. These two friends have cultivated and created tools for ceremony that are creative and help you bring out your own intuitive healing powers. Join these beauties for a day of herbal teas, as they share the stories and intentions behind all of their creations. My oh my, isn't this neighborhood filled with talent. Maybe you have seen the biology meets sculptural work expertly styled by Linda Smyth of We Who Prey. Maybe you haven't. Whatever the case, you are sue to be surprised and delighted by the creative prowess by this artistic metal smith. We are so grateful to have her as a friend and to host her for a day of jewels and beauty! Join us for our outdoor market. We will be offering herbal teas and other refreshments! We Who Prey is a jewelry company created by Linda Smyth and made in NYC. Each design is inspired by abstractions from art, biology and the human form. Through her passion for creativity, science and spirituality the exploration of these elements manifests into bold and imaginative pieces that are created to stand out as a point of conversation for a unique expression of individuality. These designs are also made to last a lifetime with an emphasis on quality materials and craftsmanship.